Sometimes, I walk into a store and just see something that inspires me. My thoughts start whiring and before I've even left the store, I'll have a vague picture of a room already formed in my head. Unfortunately for my friends and family, this means that I tend to daydream my way through shopping trips. My cup of coffee and I can get lost for a good three hours in the home decor section of any store. 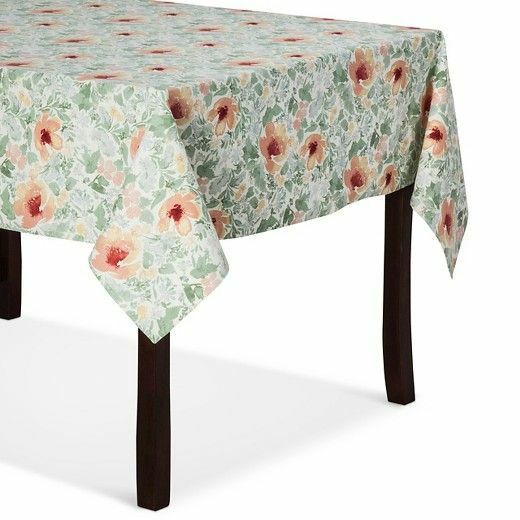 So I saw this tablecloth in Target several weeks and fell in love with the print. Since I don't currently use tablecloths(because, let's face it, we are messy eaters here and who needs more laundry? ), I've had to find other creative ways to use them in our house. I made my kitchen curtains from tablecloths. Many tablecloths are 84" long- the same length as a regular curtain panel. Hang them up with curtain ring clips and no one ever has to know! I love my basic white curtains but I thought, just for a fun exercise, that I'd design a room using this watercolor floral for the curtains instead. It is the inspiration for the entire room. All the other colors and patterns are in harmony with it. Even the style of the room is drawn from the fabric: laid-back traditional with a fresh, modern twist. 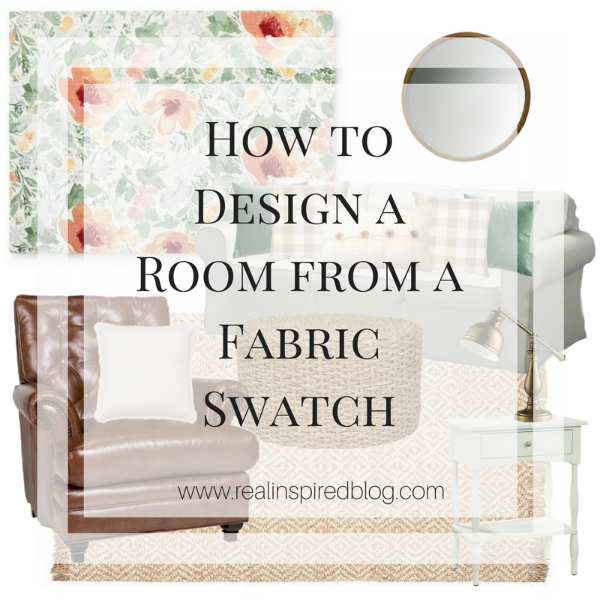 How do you design a room from one swatch of fabric? A floral pattern is considered a traditional print. This one's been given a modern update with the style and color combination. Pastel watercolors give it a casual feel and make one think of a field of wildflowers. This gives us a traditional, yet whimsical, base for the design of the room. I kept the furniture traditional, in harmony with the floral. 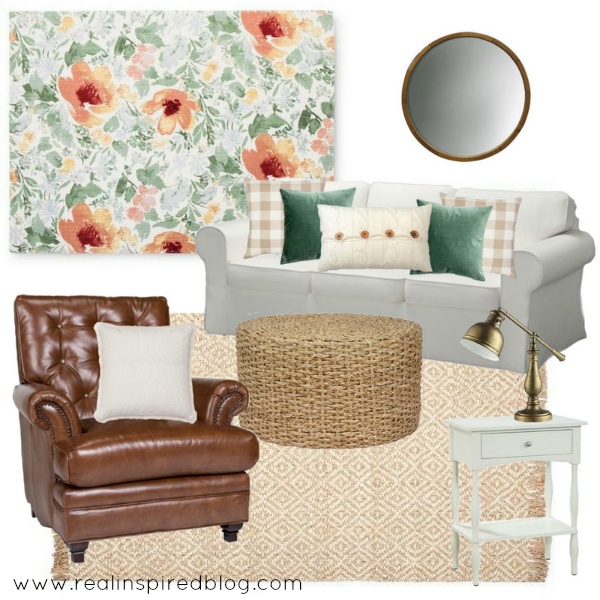 The accessories are a pretty even mix: traditional pillows and a vintage-style lamp are mixed with a modern wood mirror, jute rug, and rush grass coffee table. What makes this room work? The floral fabric and furniture create a traditional style base for the room. Gingham and velvet are both traditional materials but are opposite styles: gingham is casual while velvet is opulent. Mixing in a few modern and casual pieces(like the grass coffee table) keeps the look interesting. It's the home decor equivalent of business casual! The contrast between light and dark in the floral is echoed in the contrast between the light colored elements in the room and the darker leather chair and wood mirror. The circular mirror and coffee table break up the square shapes in the furniture and textiles. There's also a lot of contrast between soft and hard, rough and smooth. The colors in the textiles harmonize together. The warmth in the yellows and oranges in the floral are picked up in the leather, jute, wood, and brass. Rich velvet is mixed with rough jute, wood with shiny brass. The diamond pattern in the rug is echoed in the white pillow, but contrasting with the squares in the gingham. The smooth painted side tables are mixed with a rough grass coffee table. The result is a room that is cozy, yet fresh. Composed, but casual. Eclectic, yet traditional. I would love to live in this room. Honestly, I'm rethinking my current living room after this! What do you think? I'd love to hear your thoughts and questions in the comments below!